In Georgia, the state started to cut back on big rig inspections a few years ago, which led to tractor trailer crashes occurring more often. Some of those crashes involved passenger cars, with predictable results: serious injuries and deaths in some cases. Some trucking industry experts in the state government maintain that the new policy of pulling back on safety inspections is due to aggressive trucking companies and lobbyists. The pro-trucker side argued that some of the state inspectors were too aggressive, leading to trucks being pulled off the road without reason. Others say that that the trucking companies are simply very politically active and they are successful at swaying legislators to back off on safety inspections. The truckers themselves state that they try to maintain safe rigs and drive safely, but that sometimes car drivers drive in ways that put everyone in danger. One truck driver stated that he has seen car drivers jump into his lane right in front of him when he is trying to stop, or pulling off the shoulder into the lane when he is driving at 65 MPH. Also, he has seen cars exit off the interstate from the left lane, across the path of his truck at the last second. Don’t sit in a trucker’s blind spot. He can’t see you if you can’t see his side mirrors. Never pass a truck on the right when he is turning right. The truck has to swing wide left to make the right turn. Never cut in front of a truck, as they take much longer to stop. Give a truck at least 4 seconds of space in wet driving conditions and at interstate speeds. There is no question that driving unsafely around big rigs is a mistake and can lead to crashes. 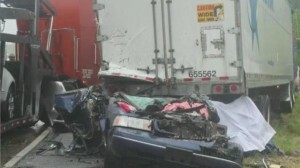 However, the major causes of big rig crashes are driver error and safety problems with trucks. Our trucking accident lawyers in Virginia have represented many families who have lost loved ones to negligent truck drivers and trucking companies. We expect that all states should be rigorous in their safety inspections to ensure public safety.